The Cover Contessa: Please Welcome Christine Hughes! Never Too Old for YA Books and I would like to welcome Christine Hughes for an interview today! Now let's all sit back and hear what Christine had to say to us in her interview. Depends. TORN took almost a year, the next one coming out (Three Days of Rain) took less than 6 months and I am halfway finished with the sequel to TORN in less than 8 weeks. I think the ability to transport me away is the cornerstone of a great story. I was swept away, with many others, when I read Harry Potter. I was running with Guy Montag in Fahrenheit 451. Pull me away from the world and have the ability to evoke emotion. I just read My Emily by Matt Patterson and cried almost the whole way through. I read The Art of Racing in the Rain and was a mess. Nineteen Minutes by Jodi Picoult also resonated with me. I read it when I was teaching - so scary. I generally write very early in the morning, generally around 5am is when I get up. I write for a few hours consistently then write sporadically or not at all the rest of the day. It is difficult, especially now that it's summer and my tow boys are home with me. I try to balance by writing early and closing the laptop for a bit when my husband first gets home from work so I'm not distracted. That one draft doesn't cut it!Gosh, I hate revising and editing and I'm not very good at it but I am getting better. It's a learning process. Thank goodness I had great beta readers and my publisher, Black Opal Books, has a great team of very patient editors. My husband says yes, I say no. I just write what I know and, since I dislike research, I only do what I need to in order to make the story believable - like geographical locations and other minor points. Ahh, my back deck on a summer morning. 11. How hard is is to self-publish or get published? I think it's difficult but I was lucky. I was picked up by Black Opal Books less than 4 months after I began the query process. They love them, or so I am told :). 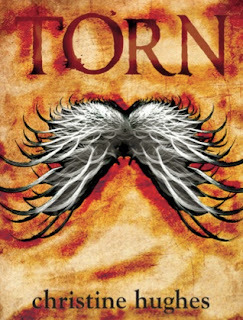 I have a 15 year-old sister in law who was the first to read TORN. She started on a Saturday and called me at 10 o'clock on Sunday night screaming about how much she loved it! We talked for over an hour with her giving me insights, what she liked, what she loved, what could be better. It was great. I like to read, go to the pool with my kids, walk around some of the small towns around here like Princeton and New Hope. I love going to the beach, visiting with family. I do lots of things. Get some honest beta readers. Don't rely on someone who is going to blow sunshine up your you-know-what. Learn to take criticism. Be open to change. Be gracious to anyone and everyone who is part of this process - bloggers, reviewers, beta readers, editors, publishers, agents - whoever. Don't stop reading. And never, ever stop writing. My dad is a Blackhawk pilot for the Army. I wanted to either do that or be a fighter jet pilot. My favorite book is Fahrenheit 451 by Ray Bradbury. That story was so beyond its time. Unreal. Inspiration? I find it everywhere. From JK Rowling and her napkin notes, Stephenie Meyer writing as a stay-at-home-mom, Hemingway's "balls-out" approach to life, Matt Patterson's courage, Brett Easton Ellis' ability to make me question "what the hell did I just read? ", Robert Frost's smooth control of the english language, Shakespeare's ability to write so many freaking lines in iambic pentameter - I mean seriously? How did he do that? Do keep trying. Don't stop. Do be gracious. Don't get outwardly angry when things don't go your way. In this business, I am finding they rarely do. Do perfect your prose. Don't assume one draft is enough. Do believe in yourself. Always. Don't lose hope. I am currently in the process of writing the as yet untitled sequel to TORN. I am in 2nd round edits with the soon to be published (date coming soon) Three Days of Rain, a Women's Fiction with a male protagonist - it's a bit of a tear jerker.